A (rather idealized) view of my home studio, in the wonderful neighbourhood of Ramsay, in the city of Calgary! Sam Hester is a Calgary artist and writer. These days I am slowly finding my way back into the world of creative art & writing, after a few years of child-related hiatus. Stay tuned! 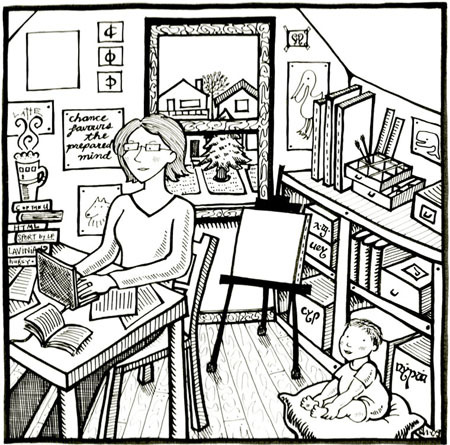 Sam's comics journal the drawing book led to her autobiographical comics being published in a few acclaimed anthologies. In 2006 she was a "top finalist" in the Portrait Society of Canada's annual international portrait competition at the Art Gallery of Ontario in Toronto. These days, Sam is writing comics that tell local stories, helping to put together some cool neighbourhood arts initiatives, and working as a graphic recorder. All with a five-year-old, a new baby, and a very patient husband. There's not a lot of sleeping going on around here right now. 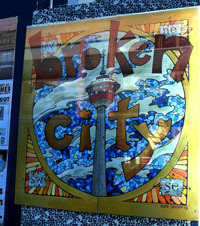 I painted the picture that's been hanging in the window over at Calgary's Broken City ever since it opened about ten years ago. I just thought I should put that in here somewhere. I wrote one of the only published academic essays (to my knowledge) about the Canadian comic strip "For Better or for Worse." (It's here.) Well, it's about some other stuff, too. Why did I do that? I used to have free time to do random things like that, back before I had a baby. 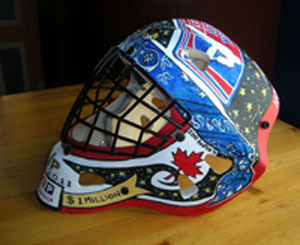 I also painted this goalie mask for Kelly Hrudey, and now apparently it's sitting in his office. It's funny because I don't know anything about hockey. But Kelly certainly seems great. He helped raise $1 million for the Woodbridge PREP Program, who asked me to create the mask. I like teen fiction better than pretty much anything else. You can ask me about it, but beware of getting me started. I used to follow Bob Dylan around, and I wrote some comics about it, a few of which are here. You can usually find me at the Calgary Comics Expo & the Edmonton Comics Expo. You can also hire me to do art & writing stuff for you - if only I can find the time to do it! I made this website myself. (In case you couldn't tell.) It was fun.